2004 Nominated Best Song : Joe Budden "Pump It Up". 2004 Nominated Best Song : Ludacris "Act a Fool". 2004 Nominated Best Song Written for a Motion Picture, Television or Other Visual Media : Ludacris, Keith McMasters "Act A Fool". 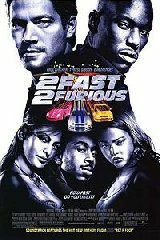 2003 Won Choice Movie Chemistry : Paul Walker and his car.